In addition to the problems that Mont Belvieu was already having with poor Internet access, the community was growing — something city leaders wanted to encourage. New subdivisions were planned but incumbent ISPs didn’t want to deploy infrastructure to the new areas, leaving residents dependent on mobile hotspots. Community leaders could only expect the situation to worsen as more people and businesses moved to Mont Belvieu. They decided that the best course of action was to invest in publicly owned Internet network infrastructure and create MB Link, a community Fiber-to-the-Home (FTTH) network for residents. Mont Belvieu decided to issue certificates of obligation (COs) to fund the deployment of a fiber optic network on which the city would offer gigabit Internet access directly to the community. COs allow local governments to borrow in order to fund public projects without first obtaining voter approval. They’re backed by property taxes or other local revenue and can be issued for up to 40-year terms. No referendum is required, but city officials must adhere to publishing requirements in order to announce the nature of the project and how it will be financed. If five or more percent of voters petition for an election on the CO issuance, the matter must go to the ballot for approval. In December 2016, the City Council adopted a Resolution to authorize a notice that they would be issuing COs not to exceed $14 million. In accordance with publishing requirements, they followed up in the local paper announcing the issuance. Based on the results of the survey on Internet access, Mont Belvieu officials felt confident that residents weren’t interested in pushing for a referendum. They were correct. The City Council adopted an ordinance issuing the COs the following January. The Community Network Map shows how publicly owned networks aren’t as prolific in Texas as in some other states. State law puts some limitations on what types of services municipalities can offer. Mont Belvieu believed they were in their right to bring FTTH to members of the community as they would electricity or water. They also believed that their chosen funding mechanism was within the boundaries of Texas law. Rather than wait for potential lawsuits against them, they asked the District Court to address the questions proactively. In February 2017, the city of Mont Belvieu filed a petition in the District Court of Chambers County asking for an Expedited Declaratory Judgment to determine whether or not they would be able to legally issue COs to fund deployment of their planned broadband infrastructure. After considering Mont Belvieu’s arguments, the court confirmed the city’s position that they had the authority to offer broadband to the public and to issue COs to fund deployment of fiber optic infrastructure. When attorneys pointed out for the court that the statutory definitions of “local exchange telephone service, basic telecommunications service, or switched access service” did not overlap with the definition of providing broadband through connections provided with a fiber optic network, the court agreed. The city also argued that the city’s planned project could not be construed as "telecommunications" as defined by the code because connectivity via fiber was not “nonswitched telecommunications services” that "connected one subscriber’s premise to another subscriber’s premise within an exchange or to a long distance provider that serves the exchange." Mont Belvieu successfully argued that the Internet access they planned to offer would connect subscribers to the Internet, rather than to long-distance providers or other subscribers. Because the Internet is not a “telecommunications provider” as defined by the Texas Utilities Code, Mont Belvieu’s plan to connect subscribers to the Internet, rather than a telecommunications provider, is not prohibited. In Texas, municipalities are either categorized as general law cities or home rule cities; Mont Belvieu is organized as a home rule city. General law cities tend to be smaller communities whose powers are limited to those specifically defined by state statute. If an authority has not been specifically granted, or the state has not implied that a community has an authority, they do not possess the authority to take action. Cities that have populations of more than 5,000 have the option to adopt home rule charters. Voters must approve the charter and subsequent changes to it. For home rule municipalities, the state constitution and statutes only present limits to their authority, rather than permissions. Unlike general law cities, they can act unless the authority they wish to exercise is expressly prohibited or preempted by the state. Clearly, the purpose of the constitutional amendment and the Enabling Act was to bestow upon all cities falling within the bracket of 5,000 inhabitants or more, the power of local self-government and full authority to do whatever the Legislature could theretofore have authorized the city to do. The result is that now it is necessary to look to the acts of the legislature not for grants of power to such cities but only for limitations on their powers. As a home rule city, Mont Belvieu had the authority to issue COs for public works projects, which includes municipal utilities, but the city needed to confirm from the court that a fiber optic network would be construed as a utility system or public works project in compliance with Texas Government Code. The code establishes the rules under which municipalities can issue public securities. The city used established Texas case law to provide examples of how previous courts have viewed the meaning of “public works” and “utilities.” The court agreed with the city's argument that a fiber optic network is a public improvement. Past case law had construed electric light plants as municipal utilities, even though they were not listed specifically in statute and the court considered the similarity valid. Mont Belvieu went on to cite the State Legislature, which codified the fact that connecting all residents is an important goal to the state. The city offers MB Link for Internet access, but no voice or video services, in keeping with state restrictions. They suggest applications that allow subscribers to use their broadband service to make calls and to stream video. Mont Belvieu is still in the process of connecting residents within the city limits to the network; next, they plan to begin connecting businesses. Residents can sign up for symmetrical gigabit Internet access for $75 per month and a one-time $150 installation fee and deposit. For a discussion about the network, check out episode 326 of the Community Broadband Bits podcast. In addition to Nathan Watkins, Christopher spoke with Assistant City Manager Scott Swigert, Dwight Thomas who is Director of Broadband and IT, and Mont Belvieu Marketing and Communications Director Brian Ligon. Other Texas communities who have heard about Mont Belvieu’s new network and their court decision have reached out to city officials to learn more. Now that the question of home rule authority has been addressed regarding deploying and funding deployment of broadband infrastructure in Texas, the door is open for more towns like Mont Belvieu to consider publicly owned options. The folks in Mont Belvieu are ready to share their discoveries. If they don't believe it, they should try it for themselves and their community. It can be done. And if you need to try it, come on down. We'll let you hop on the network and test the speed for yourself. You'll be surprised what a city with some "can do" attitude can do. 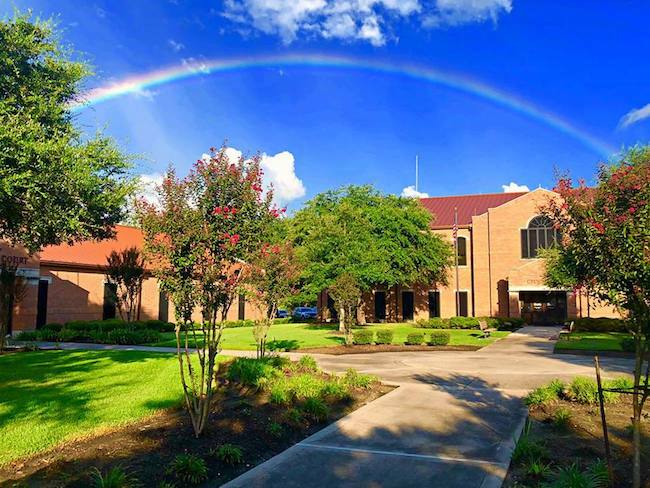 Image of Mont Belvieu City Hall courtesy of their Facebook page.